KUALA LUMPUR: It’s been close to five months since Rhone Ma Holdings Bhd made its debut on Bursa Malaysia and the animal health product manufacturer has been keeping busy, having launched 14 products since the fourth quarter of 2016 (4Q16). This is in addition to the variety of over 300 products that Rhone Ma offers, comprising more than 50 feed additive products, 250 pharmaceuticals and 80 types of vaccines. The group’s shares, meanwhile, are currently gaining traction. Last Friday, they rose 10 sen to hit a new high of RM1.32. The end-to-end animal health solution provider, distributor and supplier of food ingredients listed its shares on Dec 19 last year. The initial public offering raised RM31.59 million, most of which will be used over time for the group’s capital expenditure, which includes the construction of a new good manufacturing practice-compliant plant in Nilai, Negeri Sembilan and the construction of a new warehouse in Kapar, Selangor. Its group managing director Dr Lim Ban Keong said Rhone Ma’s existing plant at its headquarters in Petaling Jaya is reaching full capacity, and hence the need for the group to expand to be able to produce more products. “We [expect] this [new] plant to accommodate, at a minimum, four times the production capacity compared with the current one. 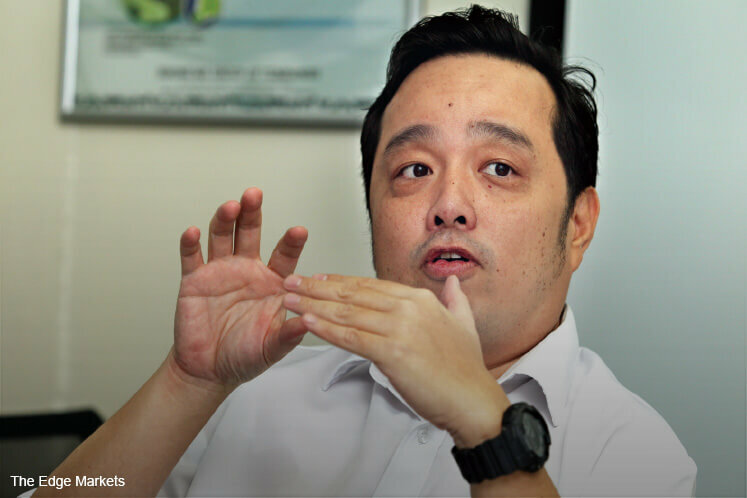 It will be ready by the fourth quarter of 2018,” Lim told The Edge Financial Daily. He added that the group would also continue to focus on developing its export businesses. The group’s revenue is primarily generated in Malaysia, with the domestic market accounting for 97.88% of total revenue as at the end of 2016, according to its latest annual report. The remaining revenue was derived from overseas markets, including the Philippines, Indonesia, Brunei, Thailand and Singapore. Rhone Ma is also planning to expand into Taiwan. Lim said the group managed to get more sales in Indonesia compared with other regional neighbours in 1Q17. He, however, declined to give a number. On its outlook for 2017, Rhone Ma sees positive earnings to be reflected from 2Q17, following the launches of 14 new products. The group also expects to launch one or two more products during the second half of the year. Lim said the group is projecting a compound annual growth rate of 5.4% between 2015 and 2020. He added that given Malaysia’s good relationship with other market “giants”, such as China and Europe, the country has the potential to export more, and the animal health solution industry can benefit from this. “We still see growth in our business [despite the weak economic conditions]. “Opportunities in the export market are there. More and more people in the animal health industry can now export their products to the Middle East, Japan, China, Indonesia [and] Singapore,” he said. “For example, Rhone Ma wants to focus on producing more feed additives because we see an opportunity there, to give better service, better quality and better solutions to the feed additives industry,” said Lim, adding that the group hopes to grow more feed additives from its research and development subsidiary, Asia-Pacific Special Nutrients Sdn Bhd. “In that sense, we are creating a bigger market. The more products you create, the bigger the market gets,” he said. Rhone Ma reported a net profit of RM9.17 million for the financial year ended Dec 31, 2016, and an earnings per share of 5.52 sen. Revenue totalled RM119.2 million. The group’s share price has risen by an impressive 76%, or 57 sen, since it was listed at 75 sen, with major gains registered since last month. Rhone Ma’s market capitalisation stands at RM219.12 million. 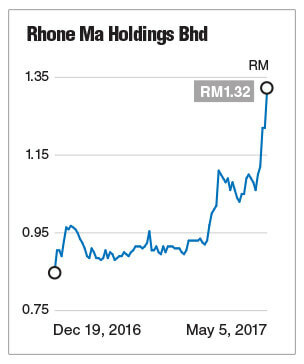 RHB Research, in a note last Thursday, said the upward momentum in Rhone Ma’s share price was likely to continue. “Towards the upside, the immediate resistance level is seen at the RM1.37 level. This is followed by the RM1.50 level,” it said. A day earlier, AllianceDBS Research noted that Rhone Ma shares had “crossed over the RM1.13 hurdle”. “The crossover of the RM1.13 hurdle would likely see Rhone Ma trading upwards with the next upside target pegged between RM1.32 and RM1.35,” it said.